Matasse stones? A set for many movies. We take two, two masterpieces. The Sassi before and after the restoration of the architect Pietro Laureano: from the Pasolini of the Gospel according to Matteo (1964) to Gibson of The Passion of the Christ (2004). And we find that the neolithic Matera is actually a city of the future thanks to its Sassi. What did he do in those 13 years? “I lived in the Sassi, pointing out how the path of the monastic movement did not go away and revitalize prehistoric roads. The history of Matera is not medieval but neolithic. My reading of the city was this: Matera is part of a very ancient story that looks to the future because it uses resources without destroying them, an alternative to this to the modern city. In Matera, a ‘troglody and parsimonious’ city, water was distilled from the caves, hanging gardens were built, there was a sustainable cycle of waste. It was not the orthogonal city of modernity, so it scares me. Pasolini chooses to indicate a pre-Christian situation, tries to bring Christ back to Eboli. Matera is, however, a city of the future, eco-sustainable. When I started my intervention, there were those who wanted to retrieve the Sassi to suit them (large containers for exhibitions for example) and those who like me wanted to safeguard their quality with a conservative restoration that would not recapture them, but use them as they are, living on. So I did. It is a message for the future, and it was a winning proposition: now the Sassi are almost completely inhabited. A city lives if inhabited, it can not become the museum itself! Important, but unintentionally negative: he created a Hollywood image. 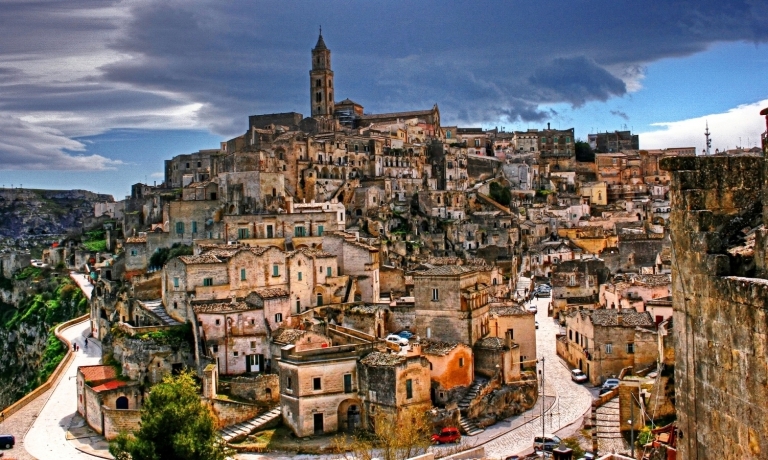 Tourists come to Matera to see the places of the movie, not to know the Sassi. Excessive fame has somewhat distorted the city. Investments were also made for speculative purposes. The Matera I left in 2005 was another, but my experience was still successful: the Sassi are preserved. I wanted greater cultural tensions to better respect the origin of the city and the eco-sustainable aspects that Matera has and now find themselves in modern architecture. With tourism and success, this has only partly taken place, but concepts that must mature locally. It takes time in short.